View the full Eldora Speedway schedule for 2019 below. Among the highlights are a giant four division season opener on Saturday, April 27 with $5,000-to-win for the Sunoco Late Models, the K&L Ready Mix NRA 360 Sprint Invaders, DIRTcar UMP Modifieds and Eldora Stock Cars. The Sunoco Late Model division will also race for $5,000-to-win on the traditional holiday Sunday events: the Johnny Appleseed Classic on Memorial Day Weekend and the Baltes Classic on Labor Day Weekend. The popular #LetsRaceTwo Doubleheader Weekend, featuring both the World of Outlaws NOS® Energy Sprint Cars and the USAC AMSOIL National Sprint Cars, returns Friday and Saturday, May 10 and 11. The winged and non-winged worlds mix again at the 38th running of the 4-Crown Nationals Weekend in Eldora’s season finale on September 27 and 28. The first $8 Family FIREWORKS Night gets a jolt of speed on May 18 when the K&L Ready Mix NRA Sprint Invaders makes their second of three stops in 2019. The winged 360 c.i. sprint cars join the DIRTcar UMP Modifieds and Eldora Stocks prior to a spectacular fireworks extravaganza. The NRA group also returns the next Sunday to be part of the Johnny Appleseed Classic. One week after the 25th running of the Dirt Late Model Dream, sprint car racing returns when the Ollie’s Bargain Outlet All Star Circuit of Champions presented by Mobil 1 brings Round #2 of Ohio Sprint Speedweek to Eldora on Saturday, June 15. Eldora will once again play host to the ASCoC championship event, as part of the 4-Crown Nationals, on Saturday, September 28. 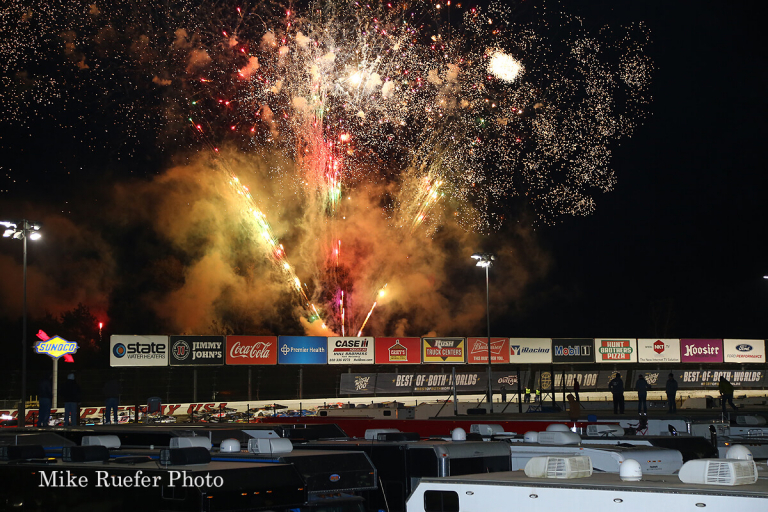 Eldora’s second $8 Family FIREWORKS Night slated for Saturday, August 3, will cap off activities surrounding the Eldora Dirt Derby. With the NASCAR Gander Outdoors Truck Series, Super DIRTcar Big-Block Modifieds and “The 127 Yard Sale – The World’s Longest Yard Sale” all taking place in short order beginning Wednesday, July 31, there will be something for everyone leading up to a fun-filled night of family fun, fireworks and racing featuring the DIRTcar UMP Modifieds, Eldora Stocks and Vores Compact Touring Series. Tickets and campsites for Eldora’s previously announced marquee events renewed at record rates. Since made available in December, the public’s appetite for dirt racing remains strong for the 25th running of the $125,000-to-win Dirt Late Model Dream on June 6-7-8, the 36th Kings Royal Weekend on July 18-19-20, the NASCAR Gander Outdoor Truck Series Eldora Dirt Derby on a new day of Thursday, August 1, and the 49th World 100 on September 5-6-7. The announced events will go on sale to the public at 10 a.m. on Monday, February 11 via www.EldoraSpeedway.com or by calling the box office at (937) 338-3815. Children aged 12 are still admitted free to all general admission and grass hillside festival seating areas with an adult. Since carved from a cornfield in the natural amphitheater that existed between the Eldora Ballroom and the Wabash River by bandleader Earl Baltes in 1954, Eldora Speedway has grown to be a frontrunner in motorsports growth and stability. Baltes chose to sell the legendary high-banked clay oval to motorsports entrepreneur and NASCAR, IndyCar and USAC champion Tony Stewart in 2004. Eldora will host its 66th consecutive season of racing in 2019 featuring the biggest events in short-track racing, including: the 25th running of the $125,000-to-win Dirt Late Model Dream Weekend; the 36th Annual Kings Royal Weekend paying over $100,000-to-win for the first-time; the Gander Outdoors Truck Series Eldora Dirt Derby – NASCAR’s only race on dirt on Thursday, August 1st; the 49th Annual World 100 Weekend; and the historic 4-Crown Nationals in late September. The complete schedule for Eldora’s 2019 season, including ticket and campsite information, is available at www.EldoraSpeedway.com. Fans can get behind-the-scenes access by following @EldoraSpeedway on social media channels Twitter, Facebook, Instagram and Snapchat. Exclusive video content posted on www.youtube.com/EldoraSpeedway has been viewed over 5.2-million times.